Monday morning: back to work, back to blogging, and only three more days until the iPad 2 is at my door. Cannot wait. Today, as the title suggests, is going to be a bit of an Igloo overload. For those of you who are from Pittsburgh or may have read one of my previous posts, the Igloo is the nickname that was given to the old home of the Pittsburgh Penguins, the Civic Arena. This is an appropriate name because, well, it looks like an Igloo. Even more appropriate that the team who (whom? nah, who) it was built for are the Penguins. What inspired this Civic Arena kick? Not too sure. Just been going through a lot of my old shots lately, and I came across a whole series that I did last year. The Penguins had an employee skating party to celebrate the end of the season and the closing of the iconic building, and since my wife falls into that category I got to attend. I knew it was going to be my last chance to take pictures of the inside of the Arena, so I snapped as many as I could before we left. With the hockey playoffs fast approaching, I have been reminiscing about the Civic Arena, and will be posting the pictures both on my blog (that’s here) and flickr. The last post that I did specifically about the Civic Arena focused on pictures of the outside, while today, you’ll get a tour of the inside. We’ll start out with the entrance to and view from our seats for almost every game. Located in C3, the single attack side (meaning the Pens only shot towards us once), they had a great view of the entire ice. You could see plays develop, pick up on opportunities, and the play was never really blocked or shielded in any way. Another place that had a great view was from the club seats or the press area, way at the top of the building. This is something that made the Igloo so unique, the domed roof made the whole place seem twice as big as it really was. Watching a game from that high up was something special, because although you could barely read the players’ names on the back of the jerseys, you could hear everything they were saying, and it really gave you a different perspective on the game. 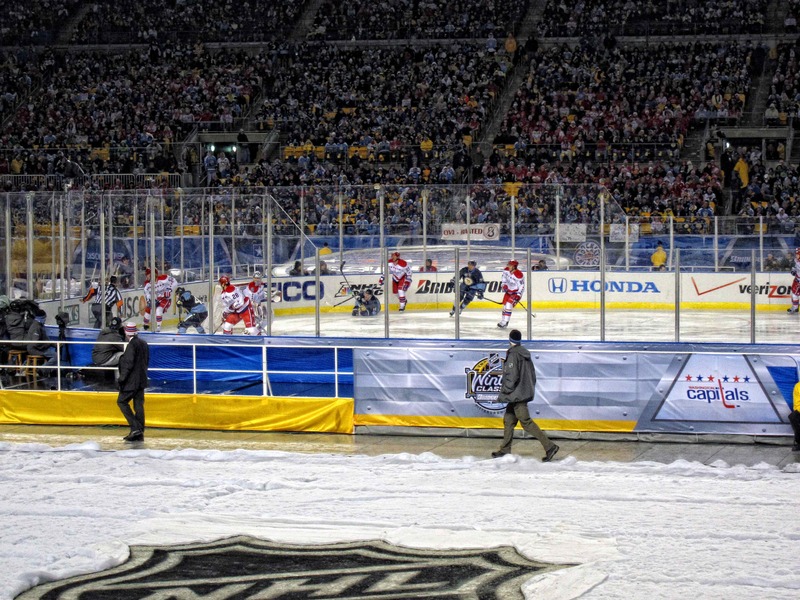 Then of course there was the ice level, where I was lucky enough to have my camera and tripod to get these shots. The first one above is from one of the goal creases, and this too gives a sense for the vastness that was the inside. 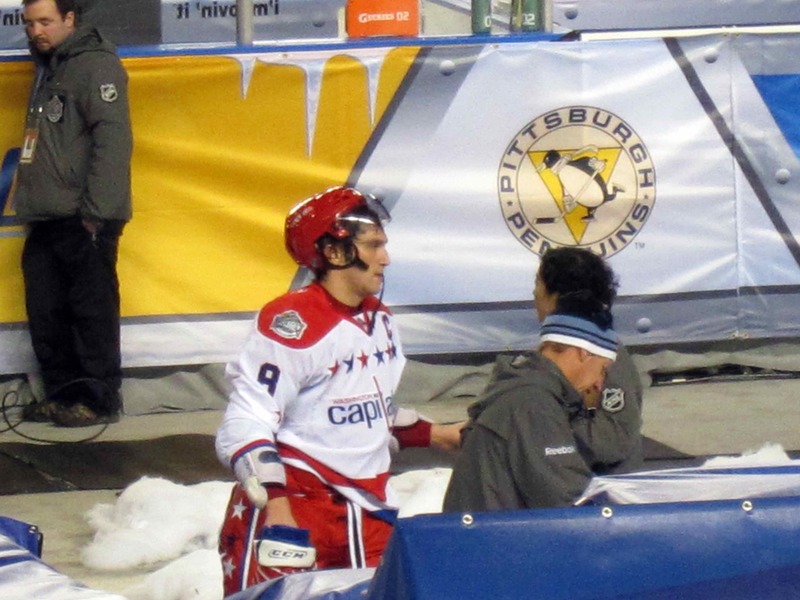 The second one above was taken from one of the penalty boxes looking towards both benches. You can see Penguin employees milling around, enjoy the last few hours of public access. Of course I had to get a picture (after waiting in line) of the locker room. Well, not actually the locker room, but the door to get in to the locker room. In the new CONSOL Energy Center, like most of the arenas around the league, the entrance to and from the locker room is behind the bench area, which is more convenient for intermissions and to handle injuries. The Civic Arena had a separate entrance however, off to the corner of the ice. To wrap it up, how about a few new pictures of the outside? This is the sign located at Gate 3 at the bottom of the Arena, welcoming fans entering from the city. If you walked up the side of the arena, you would see Gate 2, where staff and players entered, and finally Gate 3, one of the more popular gates, as it gave easy access to fans coming from above the arena as well as 5th Avenue. That’s it for the tour of the Igloo today. Let’s hope this walk down memory lane will bring them some luck against the Red Wings tonight. I believe that it has become almost customary that I post a shot from the Penguin game the day after, especially if I was there, which I was last night. It was a pivotal game, not in terms of the opponent, but in terms of the confidence level of the team, as the ranks have been depleted with injuries, including Sidney Crosby, Evgeni Malkin and Chris Kunitz. However, we got some big time play from some big times players, especially Jordan Staal, pictured here, who got the game winner with 18 seconds left in overtime, and the Pens were victorious 2-1 over the Los Angeles Kings (ahhh, there’s the reference to the title). I have been blessed in terms of the area of the country that I live in and the sporting events that I get to attend. As everyone probably knows by now, I am not a Steelers fan, however there is something to be said for the enthusiasm of their fans in the city. 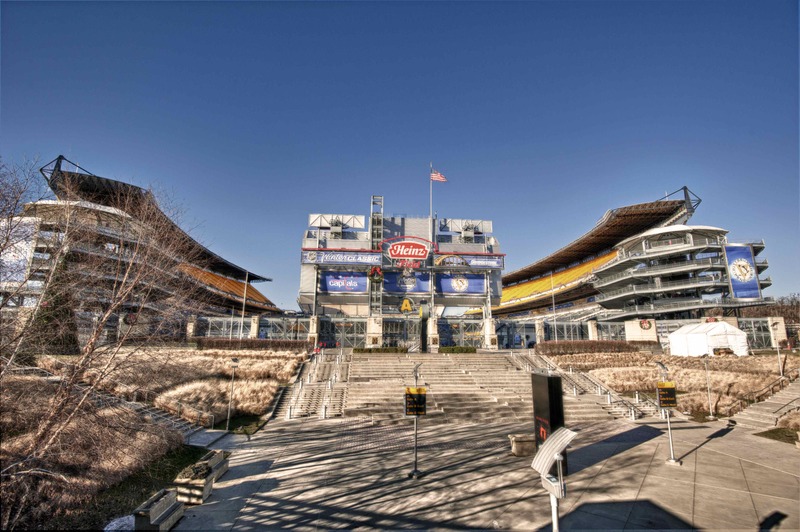 I can’t really relate to going to Heinz Field, the home of the Steelers, to watch a game, however I can hear what it gets like on TV as well as hear how incredible it is from friends and family. I obviously get to attend Penguin games, as my wife works for the team, and more nights than not the Consol Energy Center is rocking. It can be difficult for fans to get really pumped up and excited for the forty one home games a year, compared to the eight that the Steelers play, but when you win in dramatic fashion like we did last night, you swear the building is going to collapse. With hockey, different than baseball and football when you can see a score coming, you never know if your team scored until that puck crosses the goal line. And when it does, it is so exciting to see 18,000 people all jump up and starting cheering and screaming and high fiving everyone around them (whoops, don’t spill that beer!). It is such a fast action sport, there is always excitement, big hits, breakaways, great saves by the goalies. If you haven’t been to a hockey game before, it certainly is worth the trip! Aside from hockey, we have PNC Park. Now, we do have the worst baseball team of the past two decades, the Pirates, but that stadium is something to go watch a game in. You have a view of the entire skyline of Pittsburgh, and on fireworks night, the city lit up in all the different colors, it is an incredible view! I’ve also had the privilege of gong to several Penn State Nittany Lion football games. You want an electric atmosphere, go to one of those. You have almost 110,000 people in the same building, with upwards of 20,000 students, and half of the crowd has been drinking since five hours before game time. During Penn State home games, State College (where Penn State University resides) becomes the third largest city in Pennsylvania. Ok, enough sports talk for today and on to the shot! I’ve already debuted the S95 on my flickr page and my blog, but this is the first HDR that I will have posted from it. I took this last night at the game from the Brewhouse, the best place to get food and drink at the new Consol Energy Center. It has a great view overlooking the city, and last night the lighting was perfect, a nice blue hour with a hint of sun on the horizon. The warm glow of the traffic lights looked great against the sky! For the processing, this is a three exposure HDR that I put the camera on the ledge, set the self timer and snapped away. Put it through HDR Efex and then over the CS5. Added a warming filter to cool off the blue just a bit, added some contrast, recovered from highlights from the skyline as well as masked out a slight halo. Masked in one of the moving cars and lastly reduced the noise. I wasn’t thrilled about having the church in the corner of the frame and you can still see a bit of noise it the roof, but I still like the shot. For the picture of Jordan Staal, I adjusted the white balance (because shooting the arena is terrible lighting), decreased the overall saturation, reduced the red levels to give his face a more natural look and added a Tonal Contrast filter in Color Efex. That’s all for this week amigos and amigas, take care and enjoy your weekend. So my goal of this blog was not to become a Penguins centric blog, as there are already multiple Pens’ blogs out there. The original goal was to post some pictures and talk a little more in depth about the shot than I do on flickr. However, as I am trying to blog everyday (well, every weekday), it can get a bit boring and repetitive if I am just saying “Here’s this shot, this is how I took it” and so on, and that it is. That being said, I’ve tried to add a bit more commentary to my posts to hopefully keep those of your who make the daily (or weekly or monthly) trek to my blog a bit more enjoyable, because if it was just the same pictures I posted on flickr, then you wouldn’t have any reason to come here. I will say this. I have a ton of respect now for newspaper columnists, who have to write every day, though it is a bit easier for them, as the majority of the time they are reporting on news. They are still writing everyday for their job. I do it just for fun. Which I think makes it a bit easier. Anyways, moving on to more exciting topics: Geno (Evgeni Malkin) is back tonight for the Pens. Oh wait. I realized I never finished my though on the Pens’ blog thing. See that’s what happens to me when I write these. I get off on one tangent and forgot where I parked the firs tangent to get back in and keep going. I think that if you are going to write every day about something, it should be something you are passionate about, because otherwise it won’t be interesting. I am passionate about the Penguins and my photography, so it is very easy for me to write semi creatively about these two things. So while you won’t see Pens’ stuff up every day on here, you will see it. Like yesterday and today. So Geno’s back, but our stellar rookie center, Mark Letestu, is out four to six weeks for a damaged meniscus from catching an edge on the ice at Madison Square Garden in New York before the Ranger’s game on Tuesday. With Sid the Kid still out recovering from a concussion, it’s great to see Malkin back out there policing the ice (reference to title #1). It means that the opponent has to plan for a superstar and match their lines up accordingly, and just makes it more difficult to get the matchups they want. I’m not saying this demean anything else any of the Pens have done, quite the contrary actually. The depth that we have is some of, if not THE best in the NHL, which has allowed us to gain points in the standing even without the “two headed monster” (Sid and Geno) in the line up. One quick note on the aforementioned phrase. HDR Exposed (aka me) does not condone the use of this saying…actually it is quite discouraged. Just wanted to use it once, get it out of the way, and never use it again. ‘Nough said. Even though I foster incredible disdain for the Steelers, I would remiss in my blogging duties if I did not at least MENTION the Super Bowl in a few days. Packers vs. Steelers, NFC vs. AFC, the game of all games, the big game, Super Sunday, and all that jazz. I will be attending a party with a whole lot of Steeler faithful. I will also be wearing a Dallas Cowboy jersey. Probably Tony Romo…maybe Miles Austin. Not sure yet. But I will say this. Steeler fans are in for a rude awakening. Their beloved defense (which is incredible) is going to fall hard. Prediction: Packers 31, Steelers 10, Aaron Rodgers throws for 320 yards and is MVP. Ben Roethlisberger throws two picks and fumbles, and the Packers defense lives up to its billing. Let’s go Pack. Now, where is my cheesehead? …then I got home and processed it. Did my usual settings in HDR Efex, and thought to myself, “This isn’t too bad”. Took it back into CS5, masked in the moving people and the police car, applied a Tonal Contrast filter in Color Efex, burned the sky right about the horizon to give it that orange glow, boosted the blues to make the police car stand out, and while it isn’t one of my best, in the end, I like it! That’s all for this week guys! I hope you all have a great weekend! Did I mention Go Packers yet? I did? Ok, well, GO PACKERS!!!!!!! Yes, I’m done now. First off, I wanted to thank all of you who read and commented on my article yesterday. I couldn’t believe so many people stopped by and it ended up being my most heavily trafficked blog day ever! I really appreciate it! This weekend is All Star weekend both for the NFL and NHL. One I don’t care about at all, one I was really excited to watch, but probably won’t even tune in now. The one that is completely meaningless in my eyes is the NFL Pro Bowl. First off, they have it the week before the Super Bowl, meaning that the players from the top two teams remaining (notice I didn’t say best) aren’t going to be there. To me that was half the fun of the Pro Bowl, watching the Super Bowl champs play against the other all stars. Not anymore in the NFL. 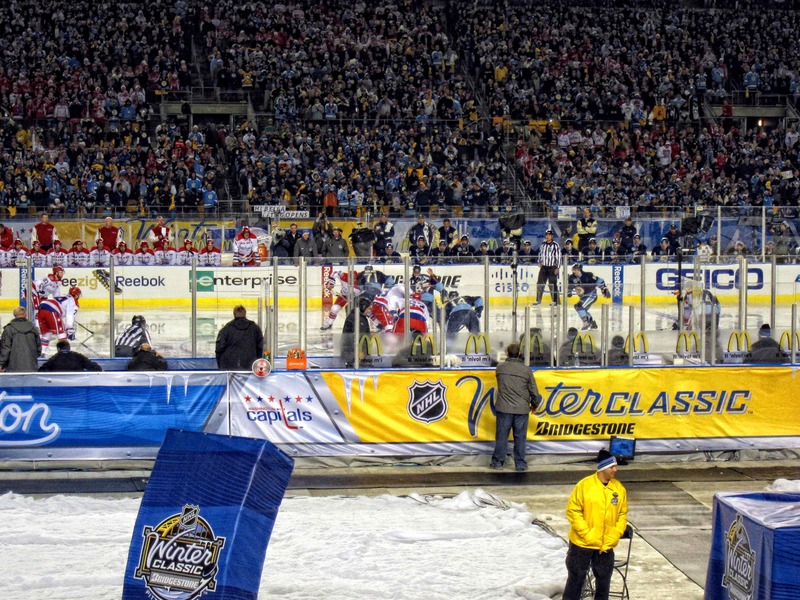 The NHL All Star game I was really excited about a few weeks ago. Sidney Crosby (pictured above) was leading the league in points and goals and beat the rest of the league by over 150,000 all star votes. I mean that is just insane. Center Evgeni Malkin was voted it, goalie Marc Andre Fleury, and defenseman Kris Letang was voted in as a write in. But, since Sid and Geno (Malkin) are still out with injury, only Fleury and Letang will play. I had a quick question too for all of my Canadian friends. How come when Pittsburgh plays in Ottawa and Montreal, Sidney Crosby gets booed worse than anywhere in the league outside of Philadelphia? I know he is competition, but he won the gold medal in the Olympics for you! I mean, I was rooting for the USA, and while I am sad we lost, I will take a loss by the hands of Sid any day. He’s the greatest player in the world, and before his career is over, he will be mentioned as one of the top three hockey players of all time, up there with Gretzky and Lemieux. I completely understand that I am biased seeing as he plays for my team, but he’s a clean player, a class act, took the team on his shoulders after Mario retired when he was only 20. If the USA would have won in dramatic fashion on an ovetime goal, I think it would be hard for me to boo the player that scored it, even if he played for the Flyers or the Capitals. Just wondering. So, finally, today’s shot. I took this last Friday evening before a happy hour with some friends in Station Square. I got there a little early to do some shooting, but I ended up with just a handful of shots because it was about 0°F, with a windchill that made it seem like -10°F. Seeing as I was on a bridge and the wind just whips down the river, it was all I could do to wait for the seven brackets and run back to my car. Which I parked in a garage that was a good ten minute walk. Genius I know. The bridge I am on is the Smithfield St. Bridge that is right next to Station Square in the South Side. It’s one of the classier bridges in downtown, with great iron work on the top that I’ve showcased a few other times. Let’s get technical, technical, I wanna get technical. Sorry about that, I don’t normally break out into song during my posts. Like I said earlier, this is a seven exposure HDR processed with HDR Efex. I kicked it over the Color Efex and applied a Tonal Contrast filter on the buildings and water (left the sky alone) and then applied a Low Key Filter to the entire image. Burned a bit of the sky in spots and added a warming filter to tone down some of the blues. I had gotten there a bit too late to get the sunset and a bit too early for the blue hour. Oh well there’s always next time! Thanks for stopping by, and if I don’t see you, good afternoon, good evening and good night! 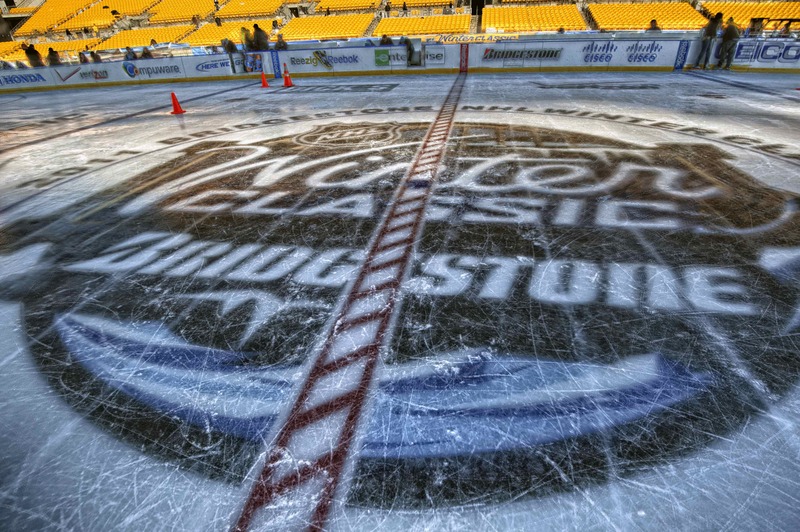 Mellon Arena…oh, how you will be missed! With the Pens in the midst of another playoff run, and since this is the last season ever at Mellon Arena, I thought I’d share some of my shots of the historic Pittsburgh landmark. But this is information you can get off any website. 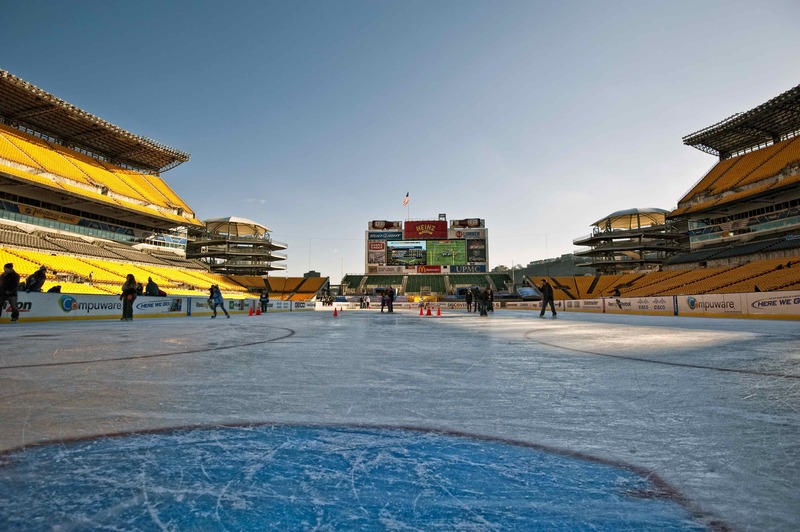 What you CAN’T find on a website is the Mellon Arena aka the Igloo aka The House that Lemieux built, experience. Now, anyone from Pittsburgh will know what I am talking about. However, for those of you who aren’t, or those of you who have been to the Arena but never to a Penguins game, here’s what you can expect, at least for another month and half or so, before the Pens move across the street to the newly built Consol Energy Center. What you can’t read on a website is how when you walk in, you immediately get inundated with the smell of every fried stadium food you can imagine. The Arena is so small, that the smell of hot dogs, nachos, fries, sausages and chicken fingers just overwhelms you, and you will find that you can still smell it on you two days and four showers later. Speaking of the limited size of the concourse of the Arena, the only place that I have ever been to that is worse is Detroit’s Joe Louis Arena, and that is only because they only have one concourse for all 20,000 fans. Mellon Arena is a bit better, as it does have two concourses, however I feel like the cowbells that people ring during the game should be distributed so we can all be herded in the intermission. “‘Scuse me, sorry about that, whoops, my fault, I’m sorry, comin’ through” is pretty much the dialogue that you hear as you meander through the crowds. What you can’t find on a website is all the different people who you see game after game. There is “Steel City Man”, dressed in armor; there is the super fan who looks strangely like Hulk Hogan; there is the girl who always wears a hockey mask and pajamas; there is the kid who puts on a show during the nightly playing of “Cotton Eye Joe” in the Igloo club; and, this time of year, there are clip on beards, painted on beards, glued on beards and of course real beards, all in support of concept of “playoff beards”. Men, women and children all partake, some better than others! And of course the last thing you can’t get off a website is the sheer awesomeness of watching Sidney Crosby and his Penguins play. The electric atmosphere when Sid or Geno touches the puck, you feel like it’s going to end up in back of the net every time. When the opponent has a breakaway, you have faith that Marc Andre Fleury will come up with a save reminiscent of the one he had against Alex Ovechkin in game 7 of last year’s conference quarterfinals, or against Dan Cleary on the breakaway in game 6 of last year’s Stanley Cup Finals. Just being there, taking it all in, and knowing that you are watching one of the greatest players to ever play the game, it’s just an experience like no other. Good luck in the second round of the playoffs against the Canadiens Pens! LET’S GO PENS!!! LET’S GO PENS!!! LET’S GO PENS!! !